Are Commercial Generators something that is important for your business? Almost every year, more than two million businesses are left without power for eight hours or longer. This can be catastrophic to business, employees and customers. These outages cost businesses $80 billion per year and can impact customer loyalty and future purchases. Standby commercial generators provide continuity, resilience and peace of mind that extends beyond the rare. 360 Energy Solutions can give you this! 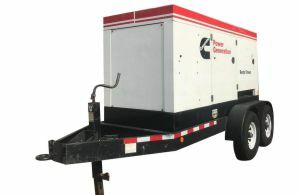 We provide our customers with the generators that they need for any sized building, big or small. Our wide selection of generators range from 20KW to 2000KW. You can count on us and know we will find a generator for you! 360 Energy Solutions has spent years developing an extensive line of Commercial Generators designed to satisfy the many plans and budgets of commercial entities. From basic tasks like lighting hallways for departing personnel to powering a major retailer's facility or a restaurant's operation, including cold storage, our quiet, reliable commercial generators cover the spectrum of load and operating ranges. Our experienced technicians can deliver your generator with speedy service and even set it up for you. We always make sure it's working for you! We understand that having a generator during a power outage is scary, so we are here to make it easier! A business is only as strong as its last sale, and with our standby generators, the cash registers don't need to stop ringing. When it comes to business operations, a lot of the tasks and jobs that need to be done on a daily basis rely heavily on office equipment and machinery. Keeping the office conducive for work also means providing a comfortable workplace for your employees. All of these can be affected in a snap when the power goes out. But if you have a commercial generator backup power, power outages won't be a problem anymore. 360 Energy Solutions has been providing reliable backup power generators to various industries for over ten years, and our strong clientele is testament to how efficient and effective our products are. Our range of diesel and natural gas commercial generators are built to withstand structural stress at maximum levels. Unlike other backup power generators available today, our generator units are designed to adapt to any surface, with maximum tolerance. Plus, our machines are built to operate efficiently with minimized maintenance time and longer use. You may like to reach us through 786-348-2156. For your reference, we are located at 7500 NW 82ND PL, Miami FL 33166. Please feel free to get in touch with us through any of the contact details provided here. We look forward to hearing from you!